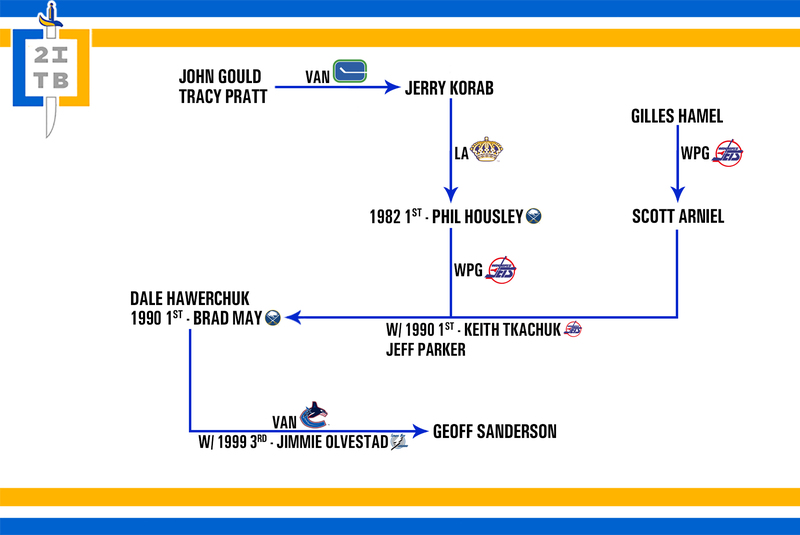 Phil Housley sits at the center of one of Buffalo’s more interesting trade trees. A memorable player in his own right, the tree includes three, maybe four, of the most iconic players to ever suit up for the Sabres. Housley’s tenure in Buffalo was somewhat rocky, with complaints about his lack of physicality and grit overshadowing his prowess as a play driver. After being selected with the pick acquired for the 1975 Cup team’s favorite players, Jerry Korab, Housley was included in a blockbuster that brought the Sabres one of the league’s best scorers. Housley had blossomed into one of the game’s most dynamic offensive defensemen and Dale Hawerchuk was a bona fide superstar. He had scored 35 or more goals in eight of his first nine NHL seasons – seven with 40-plus goals – and had six 100-point seasons. The pair came with a swap of first round picks in 1990, moving the Sabres up five spots. This is where the Jets wind up winning the trade, as they say. The Sabres selected Brady May with the 14th selection and he’d become a fan favorite and score the most famous goal in franchise history. The Jets wound up picking 500-goal and 1,000-point club member Keith Tkachuk at 19. From there the rest is history. Tkachuck would twice score 50 goals for the Jets/Coyotes before moving on to St. Louis. May was turned into a key member of the 1999 Cup team, Geoff Sanderson. This one doesn’t have the legs of something like the Martin tree or even the (spoiler alert) Dominik Hasek trade tree. But it stretches over three decades of team history, an impressive span considering the low number of players involved. Note: I made one slight alteration to this tree compared to the others: splitting Scott Arniel off separately. While he was a simple throw in to the Housley/Hawerchuk deal, I chose to include his branch to make the tree more robust. After Jacob Trouba’s surprising trade request from Winnipeg, Chris and Tyler discuss the Sabres-related focus on the request and potential for the Sabres to acquire the young blueliner. We also touch on the beginning of Sabres training camp and the battle for spots in Buffalo’s bottom six. You can subscribe to the podcast via iTunes, hit the link here to subscribe and rate. Tim Murray has had the arsenal of assets to make a major play for talent going back to his first trade deadline as the Buffalo Sabres general manager. He will enter his second trade deadline with his second major trade in his rear-view mirror. Murray shipped an impressive package of Tyler Myers, Drew Stafford, Joel Armia, Brendan Lemieux and a conditional first round draft pick to Winnipeg in exchange for Evander Kane, Zach Bogosian and Jason Kasdorf. It’s a trade the provides the Sabres with not one, but two significant pieces that fit in both the short, and long term plans of the organization. 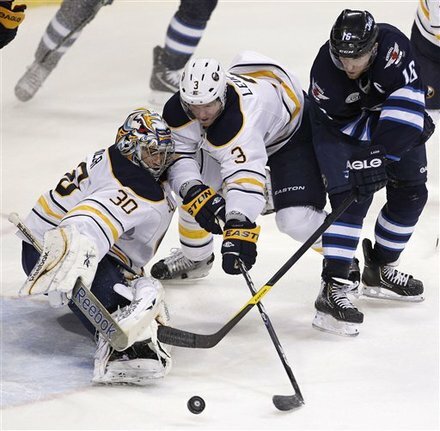 After two months of poor hockey and numerous losses, the Sabres are in a position to get back into a playoff spot against Winnipeg. With a regulation win the Sabres will be in a tie for eighth place. A win tonight would be another major step in an impressive, improbable turnaround. Ryan Miller will be back in net again tonight. His game has been in phenomenal shape as of late, but I fear that his endurance is running low after a full run of hockey since the All Star break. In the one game he had off, he played 30 minutes after Jhonas Enroth was pulled in Philadelphia.I don’t doubt Miller will still have a strong outing, I just wonder if he had been better rested if his play would be that much better. I suppose this is still in line with the goaltending schedule. Buffalo needs a 60-minute effort. They had three tough games on little rest on the West coast, tonight’s game comes after some rest for a road weary team. 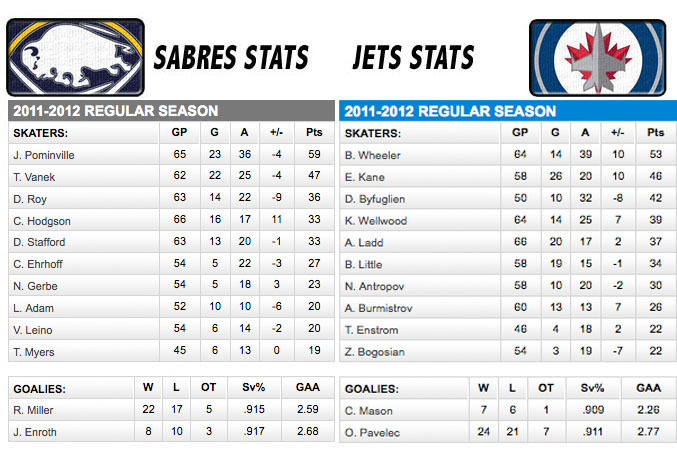 The Sabres top line has been absent as of late and that needs to change immediately. Without the production of Vanek and Pominville, the mountain that is the playoff race gets that much steeper. Vanek/Roy/Pominville. This line has been slumping for a short period of time. It is my opinion that Derek Roy has negatively impacted the play of his two wingers. Regardless of the true cause of this slump, it needs to be snapped. Vanek and Pominville have been Buffalo’s MVPs all season. Tonight would be a great day to for them to turn a corner.